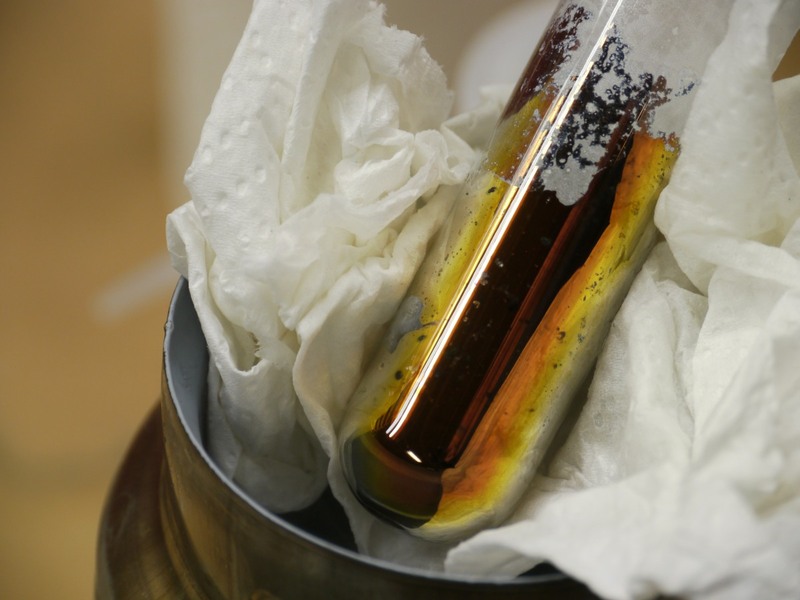 Here's an interesting reaction where lithium metal is dissolved in anhydrous ammonia. 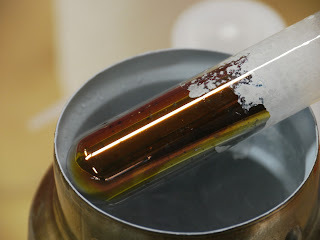 I placed a couple small pieces of lithium in a test tube, then connected the tube to a larger flask of ammonium hydroxide via silicone tubing. Upon heating the flask, gaseous ammonia will be produced which is condensed in the test tube by cooling it with a bath of alcohol and dry ice. The resulting solution is brilliant bronze in color, but at lower lithium concentrations, the solution is deep blue -- a very beautiful reaction. I found some interesting materials at a local fleamarket (http://www.electronicsfleamarket.com/): a canister of lithium sheet metal, and a bottle of fine zirconium powder (325 mesh). The zirconium is stored under water since the dry power can self-ignite, or may be ignited by static electricity or shock. Confusingly, the MSDS sheets say that dry zirconium powder must not be allowed near water, but http://www.blogger.com/img/blank.gifif it is to be stored, it must be completely submerged in water. I carefully dried a very small amount, and sprinkled it over a flame. If you know of something interesting to do with these chemicals, please let me know. Here I show how I made gassified candy (eg Pop Rocks) in my home shop. The basic procedure is to heat sugar water up to 280*F, carbonate it with 600 psi CO2 and vigorous mixing, then cool the mixture while it is still under pressure. After the mixture has solidified, rapid depressurization causes the candy to burst apart into small fragments. Each fragment has lots of tiny CO2 bubbles embedded in it. When placed on the tongue, the bubbles burst open as the candy dissolves and a popping sensation is felt. The main difficulty is building a high-pressure chamber that allows precise temperature control as well as thorough mixing of its contents while under pressure. I've built something that meets these requirements, and I've finally made a batch of candy that would pass as Pop Rocks, but they are pretty weak. I still need to adjust the temperature and mixing times to get a better product.